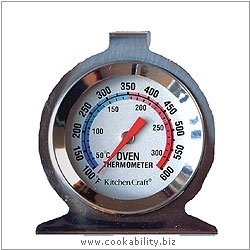 Oven thermometer with easy read dial and stainless steel case. This thermometer can either be stood in the oven or hung from a shelf. 50-300°C or 100-600°F. Design change. Larger font with centigrade outermost.